United Nations researchers report that between 1931 and 1945, the Japanese military forced an estimated 200,000 to 400,000 women and girls into institutionalized sexual slavery. Euphemistically referred to as â€œcomfort women,â€ they typically ranged in age from 11 to 33 and were taken from Japanese colonies from Korea to Indonesia. Mobilized through forced recruitment, kidnapping, false employment offers or sale by family members and employers, they served in brothels supervised by the Japanese military. 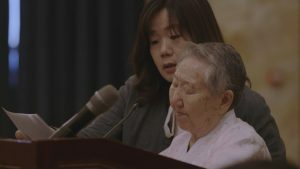 Seventy years after their imprisonment, the surviving â€œcomfort womenâ€ still await an official apology from the government of Japan. 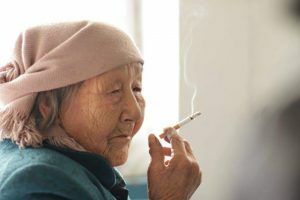 The Apology follows the personal journeys of three surviving â€œcomfort womenâ€â€”or â€œgrandmothersâ€â€”Grandma Gil in South Korea, Grandma Cao in China and Grandma Adela in the Philippines. Grandma Gil was a 13-year-old living with her family in Pyongyang, Korea, when a man promised her a factory job to lure her into sexual servitude. Grandma Adela and two friends were abducted one night by soldiers from a street corner, and Grandma Cao was one of four girls snatched when the Imperial Japanese Army invaded her mountain village. Facing fading health in their twilight years, they grapple with the impact of their wartime experiences and the legacy they will leave behind. 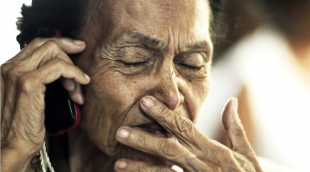 The stakes are high and itâ€™s important to talk to the few remaining comfort women who are still alive. 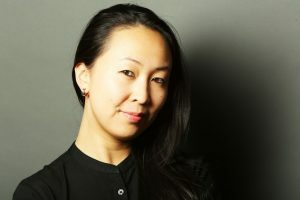 I had the chance to speak exclusively to director Tiffany Hsiung about how she first heard about the comfort women and how she went about documenting their stories. TV GOODNESS:Â I had known a little bit about the comfort women before I watched your film, but I found it really powerful and emotional. When did you know you wanted to make a film about these women and how you go about finding them? Tiffany Hsiung: “It was all kind of by fate, I guess. It was a trip that I was hired to go on with a bunch of educators across North America. It was a study tour that took educators to the survivors from World War II across Asia. Some of the survivors happened to be the former comfort women survivors as well. That’s how I first learned about the history and these atrocities; that was back in 2009. My job was to document the teachers’ learning, and that was part of the gig. But then, I got taken by all the testimonies that I was listening to and felt quite furious with the fact that I hadn’t known anything about this and very quickly realized that I wasn’t the only one. Back then, it was almost 10 years ago, not many people in the international community at that point really knew much about this history and these grandmothers were only coming out in the last couple decades. TV GOODNESS: Let’s talk a little bit about our three main characters. I found them incredibly interesting and compelling, their stories were heartbreaking. Did you know going in how you wanted to frame it or did that change after you met these women and heard their stories? Hsiung: “Well, starting off I knew that I wanted to learn more than just the atrocities. I think that at first it was listening to the testimonies, and like any testimony that you hear, it’s predominately focused on the actual act of violence itself. Rarely do they understand the impact of it and what happened in their six, seven, eight decades after the war because it was only the last two decades that the grandmothers really start coming out publicly. So, what happened during those years where we didn’t know anything about this and the world didn’t even know anything about this? I was very interested in that aspect of it and I felt like from all the things I did see, rarely is there a space for survivors to talk about that, to share that from their point of view. So that was always the initial goal. I was very young when I started, I was 25 and I thought this film could be made in two years. [Laughs.] It was my first film; I was very naÃ¯ve. After the first two years it was very clear that time, even though time is my enemy in filmmaking, I needed to be able to capture and build the relationship that I did with the grandmothers to build the trust and to truly understand what the story was and how to go about capturing the every day. Everything unfolded organically. That was something that can’t be really pre-planned as life is unfolding. That all came to me as a surprise and instead of fighting against time and feeling like I was in a rush to make this movie so justice could be served and that the world would know, I realized that by the second or third year that you can’t rush and justice came in many different forms. A form of justice is knowledge of their whole story and not just one aspect of it. With that I think I was able to really come to terms with and [be] okay with taking time and watching it just unravel as it does. Slowly the story carved itself out and changes within the grandmothers happened that I never thought would. I never thought that Grandma Adela would want to eventually tell her children. I thought I would be documenting a woman that was showing us what shame and stigma looks like on an 80 year-old woman. With Grandma Cao, I just wanted to document the stoic, independent, fierce grandmother that lived alone and the dynamic with her and her adopted daughter. I didn’t know that her adopted daughter didn’t know about the details. â€˜Cause I figured she would know, since she knew that we were filming about her mother’s past. So that all unfolded as it did. With Grandma Gil, she’s actually someone who’s been in the lime light for quite some time now. She’s told her stories many times, she’s on the front line demonstrating and so really it’s her story. It was capturing who is this woman with her fist up in the air? What’s the toll it takes for someone to keep doing what she’s doing and why does she do it? The Apology premieres Monday, October 22nd at 10/9c on PBS and will be available the next day on pbs.org. Here’s part 2 of my exclusive interview with director Tiffany Hsiung. I got in on the “Comfort Women” tv show when it was about halfway through and was astonished at the atrocities suffered by these brave women in their young lives. I cried along with everyone else when Adela decided to tell her story and was so upset that she had been so mistreated because she was a victim of those wartime (to me) crimes. I hope and pray that Japan gives a heartfelt apology to these women for the suffering they endured. I believe in all of them, all of the women who were silent for so long about this part of their lives. Thank you so much for your response. I can’t remember when I first heard about comfort women, but I had to idea the atrocities these women had to endure. And that they still haven’t received an apology. It’s criminal! But maybe justice has been served in some very small way, because at least the truth is emerging.